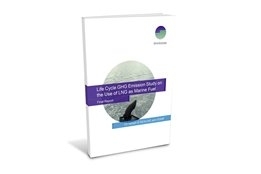 LNG bunker advocates SEA\LNG and The Society for Gas as a Marine Fuel (SGMF) have released the results of their much anticipated "Well-to-Wake" study on lifecycle Greenhouse Gas (GHG) emissions from the use of gas as a marine fuel. The headline number: using LNG can provide lifecycle GHG savings of up to 21% compared with current oil-based bunkers. The study was conducted by consultants thinkstep and is the first comprehensive scientific study the groups have presented as part of the ongoing and increasingly contentious debate on LNG's ability to reduce shipping GHGs. Pro-LNG parties will no doubt see the work as being particularly important as it comes in response to several other studies that have found there are little to no GHG savings from the use of LNG bunkers. The findings of the thinkstep study are largely inline with the groups' long held position that realistic reductions of GHGs by 10-20% are achievable through the use of LNG as a marine fuel. This is now a position they can say is backed by a body of work the groups stress is both comprehensive and peer-reviewed. The report also confirmed several other long-standing messages from pro-LNG camps, including that the use of LNG substantially reduces SOx, NOx, and particulate matter (PM). Although this was never really in doubt as the science here is relatively straightforward, advocates will presumably still welcome this message being reinforced once again, particularly when it comes to improving the air quality of ports and coastal areas. But key to the study and much more difficult to assess is LNG's GHG performance, and delving into the details of the report reinforces something else we already knew - it is very difficult to distill something as complex as global shipping GHG emissions into a single number. This is not only because factors such as fugitive emissions are difficult to assess, but as the study points out GHG emissions of fuel supply chains differ from region to region due to a large number of variables. Relative savings are also dependant on what engine technology and reference fuels are being used for the comparison. For example, the study finds that when comparing gas to HSFO fuelled engines the lifecycle savings are between 14% and 21% for 2-stroke slow speed engines, and between 7% to 15% for 4-stroke medium speed engines. Translating this into what savings would look like on a global scale, the study says that if the entire marine transport fleet for 2015 were to completely switch to LNG then, based upon engine technology, there would be a GHG emission reduction of 15%. Presenting the results at an event in London on Thursday, the groups were keen to stress the quality and credibility of the study, such as the fact it uses the most up-to-date primary data courtesy of numerous Original Equipment Manufacturers including Caterpillar, MAN Energy Solutions and Wärtsilä, as well as data on the supply side from the likes of ExxonMobil, Shell, and Total. It was also conducted to ISO standards and said to have been peer-reviewed by leading academics from key institutions in France, Germany, Japan and the USA. Perhaps a bigger question than the study's credibility is whether it shows LNG to be a big enough step forward on reducing GHGs, particularly in light of the upcoming IMO2030 and IMO2050 GHG reduction targets of 40% and 50% respectively. Indeed, critics have long held that LNG's GHG savings fall short of the required mark. Faig Abbasov, shipping officer at environmental group and LNG critics Transport & Environment (T&E), indicated the thinkstep study has done little to change his view. "This is nothing but a hopeless spin by SEA\LNG," he told Ship & Bunker. "It is simple chemistry that LNG has less carbon atoms than MGO/HFO. The problem is the practical methane leakage during extraction and transportation and methane slip during the on-board combustion." Taking the opposite view is SEA\LNG Chairman, Peter Keller, who says the study is "a long-awaited piece of the 'LNG as a marine fuel' puzzle." "It not only confirms what we already knew in terms of LNG's immediate impact on air quality, human health and its cleanliness, but clearly highlights the genuine, substantiated GHG benefits of using today's marine engines capable of burning natural gas," he said in comments alongside the release of the study. "Moving from current Heavy Fuel Oil (HFO) to LNG does reduce GHG emissions. LNG does contribute to the International Maritime Organisation (IMO) GHG reduction targets. And it is clear that LNG is the most environmentally-friendly marine fuel that is readily available and safe, both today and in the foreseeable future." But regardless, prices won't return to 2018 highs anytime soon.